Intensifying its agitation for the establishment of a permanent High Court bench in western Odisha, the Central Action Committee (CAC) of All-Western Odisha Bar Association (AWOBA) today launched a 48-hour ‘Maha bandh’ in the western districts of the State. The Sambalpur Bar Association including various lawyer associations of different districts and social and cultural organisation of western Odisha have taken part in the two-day-long ‘Maha bandh’. As a result, normal life has come to a grinding halt in the region since today morning. Shops, various educational, business establishments & markets have remained closed due to the bandh. The Biju Patnaik University of Technology (BPUT) has also postponed its examination to be held today. However, emergency services have been kept out of the purview of the strike. 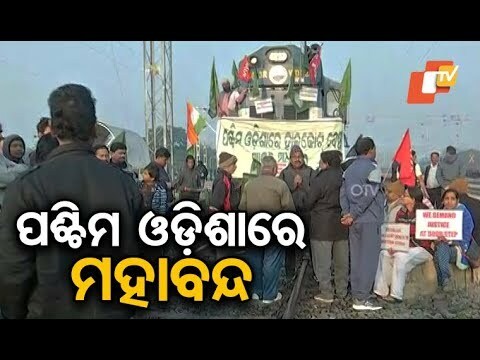 Meanwhile, the agitating lawyers of Sambalpur district staged ‘rail roko’ at Khetrajpur railway station disrupting rail services in the district. Sambalpur-Puri and Sambalpur-Rayagada Intercity trains were halted in the station to mark the bandh. “However, emergency services like ambulance, medical, water supply have been exempted. We will completely disrupt the rail services during the ‘Maha bandh’,” said Bijitendra Pradhan, President of the Sambalpur District Bar Association. “The Chief Minister had written thrice to the Central Government to take steps to establish permanent HC bench in western Odisha. But as the demands were not fulfilled, we have resorted to the Maha bandh,” said Sambalpur MLA Raseswari Panigrahi, who also took part in the agitation at Khetrajpur railway station. On the other hand, the Balangir Bar Association has decided not to participate in the two-day-long shutdown. Instead, it will launch a separate agitation for the establishment of High Court bench in Bolangir. The lawyers’ body has decided to launch cease work strike in the district from December 1 to 15 to press for their demand. The lawyers have also called for a bandh in Bolangir on December 3 over the demand. Members of the Bolangir Bar Association will also shut down courts in the district from December 3 to 10 as a mark of protest. As a fire burns dry grass to ashes, So the holy name of the Lord, Whether chanted knowingly or unknowingly, burns to ashes, without fail, all the reactions of one's sinful activities. Avengers: Endgame ticket bookings are now live in India, slightly ahead of schedule. Avengers: Endgame India release date is April 26. Amazon is making a section of its drivers take selfies before resuming their duties for the day in order to record and verify their identities. The Tata Sky regional smart plans include the Hindi Smart plan, the Gujarati Smart plan, the Punjabi Smart plan, the Marathi Smart plan, and so on. CEO Madhav Sheth has now teased that the phone will be able to produce 64-megapixel images, using a new mode called Ultra HD. The CIA accused Huawei of receiving funding from China's National Security Commission, The Times said on Saturday. As per the listing, the upcoming Samsung Galaxy A10e will run on Android Pie and support dual-band Wi-Fi 802.11 a/b/g/n/ac. Marcus Hutchins said, "I've pleaded guilty to two charges related to writing malware in the years prior to my career in security." The Huawei P30 Pro is also put through the flame test, and its sides and its back are also scratched to see the durability of the phone after prolonged use. Inbox by Gmail was shut down on April 2, but some users were able to still use it by installing old Android and iOS APKs.